50% of men experience hair loss in their life when they reach the age of 50, with increased changes in lifestyle and many external factors like stress, pollution, chemicals applied on hair, medicines, hormones etc. has caused hair thinning and a visible receding hair line to appear in men who are already in their 30s. Baldness and hair thinning can sometimes create a lack of confidence while living in a society. Hair transplant, a surgical technique can help you get rid of your hair loss problem once and for all. In this treatment, individual hair follicles from a hairy area or donor site are transplanted onto a bald or barren area on any other part of the body. Hair transplants are permanent and prevent future hair loss promoting hair growth in a span of 4-6 months. This innovative method of hair transplant takes individual hair follicles from the nape of the neck (donor area) and transplants them into the area of thinning/baldness. It is a relatively new technique with only a small number of surgeons being able to perform it in the UK. 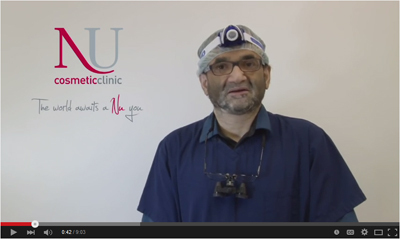 At Nu Hair Clinic, we have some of the best surgeons in the UK who can perform this procedure. This option is sometimes preferable for those who are concerned about visible scarring that can be encountered with other methods, or for those clients who intend to have very short hairstyles. As each individual follicular unit is taken independently, the process is quite labour intensive and the amount taken for the procedure will vary widely depending on the area to be treated and hair density. We generally recommend that the surgery takes place in sessions over a number of days. This ensures that the Surgeon and his team can stay focused on this intricate work. During the procedure each unit is taken from the donor area using an 8mm-1mm “punch”. Once enough follicles have been extracted, the receiving area is then prepared. Follicles are implanted at a very specific angle which gives the transplant the best chance of success.The whole process takes place under local anaesthetic meaning that you will be awake during the procedure but you will not feel any pain. Results are visible immediately; however the full effect will not be achieved until approximately 6 -12 months after the transplant. This technique of hair transplant involves removing strips of hair from donor areas at the back or sides of the head. The surgeon then removes the individual hair units (comprising of 1-3 hairs) and implants these individually into the area of thinning or baldness. The incisions that the surgeon uses to implant the hairs are very tiny; sometimes compared to pin pricks, This leads to a very natural looking hairline. The procedure takes place under local anaesthetic meaning you will be awake throughout but will not feel any pain. From start to finish, it normally lasts between 4-7 hours depending on the area to be treated. After the hair transplant, your hair may become sore and may need to take medications to heal and relieve the pain for several days. Antibiotics may also be prescribed to reduce the risk of infection and inflammation. You can resume your work after surgery and it is normal to notice hair fall after two to three weeks of treatment after which new hair starts to grow. Many patients can notice new hair growth in six to nine months after the surgery. Rogaine or Propecia are often recommended by doctors to encourage new hair growth and stop future hair loss. Patients are required to take medications as prescribed by the doctor after the surgery to ensure that you have beautiful locks even after the surgery for a longer time. Minor hair treatments are also advised by doctors to stop hair loss and improve hair growth. All instructions and details from the surgeon need to be carefully monitored and followed strictly for long lasting hair growth. Nu Hair Clinic has some of the best surgeons in the country to perform all the advanced and innovative treatments for hair loss, the clinic has all the latest equipment’s and techniques to support our surgeons and his team of professionals during and after the treatment. All our surgeons and doctors are well experienced, trained, experts and professionals in the field. All our patients are very happy with the results, doctors, treatments and services offered at the Nu Hair Clinic. Most of our patients come back to us for further feedback and suggestions to improve their hair texture and growth. New patients that mostly visit our clinic are often recommended by our existing or old patients, and they are always happy with the behaviour and service of the doctors rendered while at the clinic. Prices at Nu Hair Clinic vary according to treatments and the treated area, and are often affordable and comparatively lesser in price. 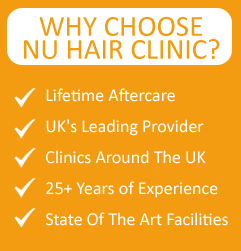 Nu Hair Clinic in UK offers the best treatment for the best price offering you a solution to last a lifetime for your hair loss problem. Nu Hair Clinic offers financial help for those who wish to have their hair loss treatment but are now facing monetary difficulties. We make it possible for you to let your dreams come true and have awesome hair days for a longer time.